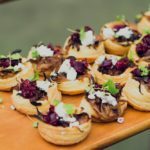 On Thursday, 28 February, on a warm and balmy night, I headed off to the Spanish Summer Garden Party proudly presented by the European Women in Business. Hola! These women certainly embrace a fashionable and glamorous way to network. The spicy aromas of a delectable Spanish paella from Raw Materials tickled my nose as I approached the venue. This was followed by an intoxicating fragrance from the stunning floral displays on show at the Flower Temple, where the event was held, which put me under some kind of spell. I had no choice but to follow my nose. I was truly surrounded by beauty and opulence. As the guests gathered amongst the colourful blooms, they were tantalized by a parade of bright, stylish, comfortable footwear by Kolourful Kati and beautifully crafted European fashion designs provided by Almarker. Fourth Wave Elefante and Dog Rock from Vino Bambino, provided drinks that tickled ones taste buds. Sisko Chocolates, Sweet Cantina tempted the room with their delicious treats, and with the launch of the MOR emporium, all senses were indulged. Spain has been one of the domineering cultural centres of Europe and this event created an influential blend of Spanish, Mexican and Latino cultures. Delegates from La Camera, Spanish Chamber of Commerce and The Mexican Chamber of Commerce were amongst the many amazing guests. As the room was alive with chatter, the beautiful Janine Lum from European Women in Business introduced guest presenter Fabiola Dos Santos a Venezuelan lawyer who grew up surrounded by her (massive) Italian and Portuguese family. Fabiola moved to Melbourne in 2009 in the hopes of finding an inspiring city in which she could thrive and grow both professionally and personally. As a senior trade Marks attorney at FAL Lawyers she believes being surrounded by loving and caring people in her life is paramount. Her presentation “The Power of Attitude & Self Esteem” had the audience completely focused and absorbed. Fabiola believes that attitude has played a huge part in her life. ‘Your attitude, not your aptitude, will determine your altitude’ is a motto she lives by. With all our sense captivated in one evening, we enjoyed some wonderful entertainment by Flamenco dancer Fernando Mira. Fernando commenced his Flamenco Dance training at the Gonzalez Flamenco Academy in Fitzroy in 1979, and he travels to Spain regularly to attend workshops developing new flamenco dance techniques. He had the women out of their seats tapping away to the hypnotic rhythm. Accompanying him was guitarist Valentino who has performed at various venues throughout Australia, appeared on television shows, contests, films, and also starred in Flamenco Fire. Mingling with these fascinating women was delightful. As we all chatted, once again we were indulged with a delectable chocolate moose and delicate sweets. As I gathered myself to leave with goodie bag in tow, I had the absolute pleasure of meeting inspiring author Shannah Kennedy. She happily signed a copy of her new book fo “simplify structure succeed” which is about mastering the art of balance in today’s modern life. Now this was a wonderful close to a fabulous cultural evening! Operating since February 2012, European Women in Business provides a unique networking platform for women in business that wish to surround themselves with diverse, stylish themed events and network with other dynamic women. Our prestigious events and business presentations offer not only the opportunity to pursue career advancement, but also personal and professional development for work, life, balance within a friendly and social setting. Guests experience exclusive opportunities to view high quality brands, which will enhance their style, presentation and life opportunities. Networking is a priority and our events enrich their lives and give them advantages in the business world blending networking, culture, artefacts, business and magnificent surroundings. 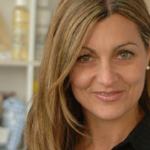 Visit their website www.europeanwomeninbusiness.com.au. 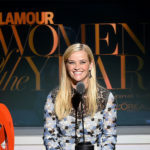 If you have a website, blog or business that’s keeping your passions alive, we’ll tweet about you and give you a shout out on the WOMAN.com.au Facebook page. Because we want the whole world to know your story and all the cool things you’re doing. Find out more about #itweetyou here.